COMPARISON – So what other current American vernacular music group might be a contender for the best band on the scene today? Plenty of you may make staunch cases for innovative and artful bands like Wilco, My Morning Jacket, The Hold Steady, The National, The Drive-By Truckers and others. But another band, like TTB, plumbs and propels roots-music genres with rare artistry. Alison Krauss & Union Station also boasts a great female lead singer/instrumentalist and a master string instrumentalist, and provide an interesting contrast as an acoustic band. This band has two strong lead singers in Krauss and Dan Tyminski, whose sinewy bluegrass voice dubbed George Clooney’s singing in the Coen brothers movie O Brother Where Art Thou? He and Krauss also greatly aided that soundtrack album’s remarkable advancement of bluegrass music into the mainstream. Union Station’s dobro player Jerry Douglas is among the most resourceful and fluent stylists in contemporary music and banjoist-guitarist Ron Block is no front porch picker. Krauss’ wide-ranging Grammy-studded career speaks volumes for itself — recently highlighted by her stunning 2009 collaboration with Robert Plant, Raising Sand, which won the Album of the Year Grammy. She’s a rare and exquisite singer and interpreter and an expert bluegrass fiddler whose done as much as anyone in recent memory to bring traditional country and bluegrass to wider audiences. But we’re comparing groups here. 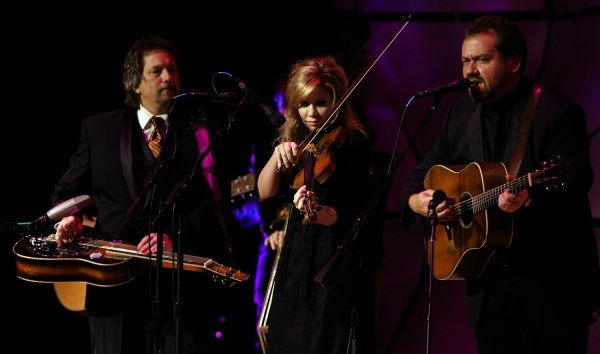 AK & US has a far longer and celebrated track record as a group and they matched TTB in their genre category by snagging the 2012 Grammy for Best Bluegrass Album for Paper Airplane. AK & US brilliantly combines bluegrass, country and folk musics with a contemporaneity that honors and expands those traditions. Comparably, TTB mixes blues, rock, R&B, gospel and jazz into their own meaty stew. Yet neither Krauss nor Douglas in Union Station has the stylistic and expressive range and dynamic power of Tedeschi-Trucks, though admittedly we’re comparing a largely acoustic group to an electric one. And yet, TTB also plays pianissimo superbly. 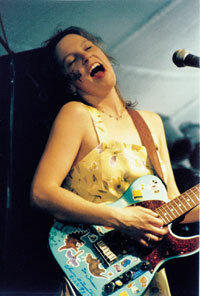 Her band also has a strong second lead vocalist, Mike Mattison, the lead singer of Trucks’ band before his wife joined. Mattison has taken a back seat to her; yet Tedeschi is so compelling and dynamically varied that few want to stop listening to her. By contrast, the sweet, angelic purity of Krauss’s soprano, lovely as it is, calls for auditory contrast much sooner, to my tastes. A CLOSER LOOK AT MUSICAL CHEMISTRY — Tedeschi and Trucks met in New Orleans when her band opened for the Allman Brothers Band’s 1999 Summer Tour. These great individual talents now compound each other. One apparently jealous concertgoer complained that Tedeschi spent too much time focused on Trucks playing onstage rather than playing to the audience. To me this reflects the couple’s intense synchronicity, wrought by their working together as two great musicians, in love. More than just a singer, she’s also a fine blues guitarist who obviously appreciates and feeds off of her husband’s instrumental brilliance. Such evident marital chemistry is pretty rare to witness onstage and a key to the heights this group has achieved so swiftly. This band has a familial chemistry that, like many marriages, may not last a lifetime, but for now it’s incendiary. So you can’t help for rooting for the old marital institution in this case. This union benefits millions more than themselves and their family. Part of the group’s success is that, for all its instrumental prowess — all three horn players receive solo spotlights sooner or later — it does not consider itself a jam band, and their song orientation has helped them reach a larger audience even though in concert their tunes typically stretch to 10 and 15 minutes. But there seems to be a discipline, a self-awareness and sense of form to the groups improvising, led by Trucks’ almost invariably well-structured solos and incisively crucial accompaniment their songs. Consider a close listen to “Until You Remember.” A mournful brass obbligato opens, gently mocking the prayerful supplication that follows. The song then proceeds unassumingly, the singer beginning to seem self-pitying, rocking between F and D and A-flat and E flat, with the forsaken woman singing almost to herself. I know it ain’t refined/but I’ll hold your place in line/’til you remember that your mine. The pedal C sharp tolls over each of these phrases. 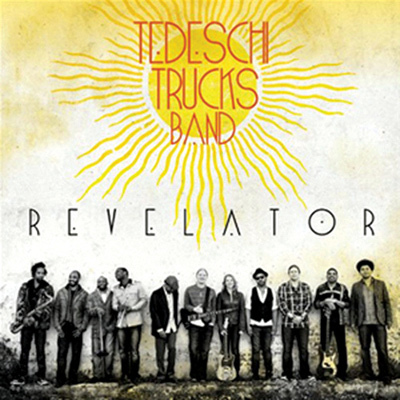 That harmonic blues descent, combined with Tedeschi’s brave vocal response, is the majestic backbone of the song. Trucks then lashes the chord changes with blood-on-my-fingers guitar, even though it’s a mere few moments, rather than a drawn-out solo. As with most of their originals, poised understatement and emotionally charged climaxes show the group’s artistic maturity. Trucks normally plays that bottleneck in an open E tuning, which allows him a sort of modal and enharmonic freedom, and a sharp chromatic potency. But he can also play with deft finger fretting, often on the slower tunes. This sophistication reflects the jazz and eastern music influences Trucks brings to the band. I didn’t warm up immediately to Truck’s style but now the slight chill effect of his slide tone sounds slightly akin to John Coltrane’s very tight reed sound, which conveyed an unlikely taciturn melancholy under all his expressionistic flights. Some of these moments may feel less than riveting to a home listener, but far more often the cover song arrangements and the solos display consistent wit, fire and imagination — possibly better appreciated as musical theater, especially bassist-vocalist Otiel Burbridge (who recently announced he was leaving for his family.). From its searing peak moments to its most genre-stretching jams, this band represents a deep expansive redefinition of the blues. The speed with which The Tedeschi Trucks Band has traveled so far in the last year also strongly suggests they may be carrying much of this nation’s very troubled Zeitgeist — in a more existential way which the music embodies, and transcends, as only great music can. It feels that way also because of how this band — of multiple racial hues — recasts America’s native culture which, like so much of our tragic and heroic history, emerges from the South. Yet the real forsaken lives that dwell in the blues today, the struggles of race and class, come from just about everywhere. If this motley-but-inspired crew doesn’t speak for the 99%, who does? 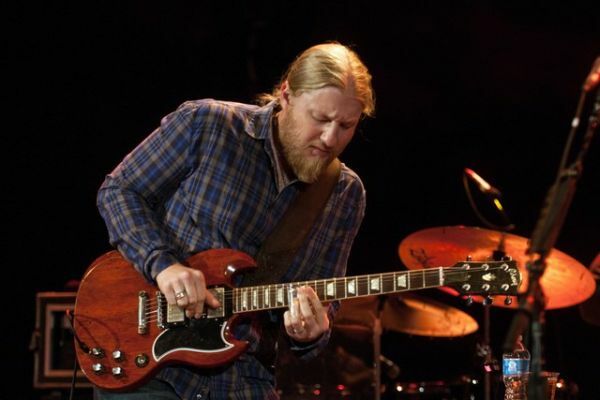 The band’s African-American Harvard-educated singer Mike Mattison (who wrote “Midnight in Harlem” and “Bound for Glory” among others) touched on this in the liner notes to Road Songs, the two-record live album that the Derek Trucks Band released shortly before that band’s hiatus, which led to the expanded new band. I’m sure Mattison would say as much about the Tedeschi Trucks Band. Does American music gets any better than this today? What do you think? * “Space Captain,” an old Joe Cocker song, was also Tedeschi and Trucks’ powerful contribution to Herbie Hancock’s ambitious international Imagine recording project, which demonstrated a great sense of jazz dialogue amongst the musicians. 6 Suarez, Ernest “‘Already Free,’ Trucks Rolls On The Guitar Hero Pays Homage to the Past”. The Washington Post. http://www.washingtonpost.com/wp-dyn/content/article/2009/05/28/AR2009052801213.html. Retrieved 2009-10-03. Is the Tedeschi Trucks Band the Best American Group Working Today? When Susan Tedeschi joined forces with Derek Trucks their combined surnames hardly made for a mellifluous moniker. But this crew is doing some of the heaviest lifting in contemporary music today, and delivering the goods to fresh and fertile places. Their name’s assonance may grind like a 16 wheeler, but The Tedeschi Trucks Band hauls loads of subtle artistry along with its pile of stylistic influences. And with the results, I say, keep on truckin’. 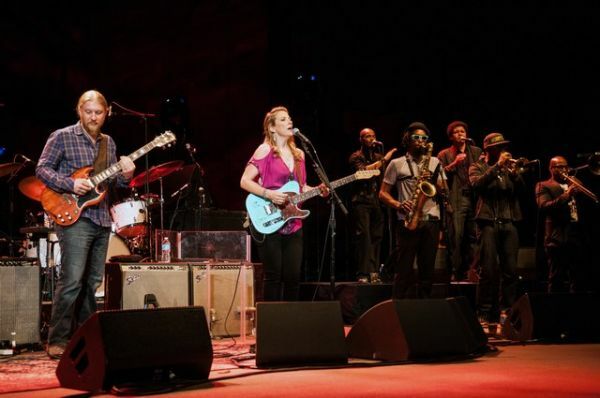 Is Tedeschi-Trucks the best American band on the road today? I can’t remember the last time I’ve felt compelled to ask such a question about a performing group, especially one who has only one studio album and one live recording. To fortify that live-concert poll, I’ll consider material that my blog readers can refer to: the band’s one studio album Revelator, their live recording Everybody’s Talkin’ and a number of You Tubes of concert footage. Along with the extraordinary quality of the Grammy-winning studio recording, this group has become a phenomenon because of its in-concert range and dynamism. That’s demonstrated on the two record set Everybody’s Talkin’ album, which may find a ranking among extraordinary two-record live rock albums worthy of their length: Bob Dylan’s The Royal Albert Hall Concert, Cream’s Wheels of Fire, The Grateful Dead’s Live Dead, Santana’s three-record set Lotus and the Allman Brothers’ Live at the Fillmore East. It was clearly evident how these performers could revitalize classic material with their cross-vernacular spin. “Any Day” was right in their wheelhouse, being from the Layla album by Derek and the Dominoes (a.k.a. Eric Clapton, Duane Allman and friends) which is a primary touchstone for guitarist Trucks’ style. (Trucks was named by his father — original Allman Brothers drummer Butch Trucks — for the Layla band’s mythical “Derek,” and Allman is admittedly his main guitar influence, along with Elmore James.) Here vocalist Mike Mattison shows his singing chops by sharing the lead vocals with Tedeschi. Truck’s solo climbs through vintage Allman Brothers licks — a hot melding of Duane Allman’s blues intensity and Dickey Betts’ lyrical ardor — and climaxes with some intoxicatingly woozy chords. It’s a performance that clearly gasses Clapton himself and emcee Bill Murray, among others, from the side stage. I played this video for my cultural journalism class at Edgewood College and my students loved it. A couple of them came up to me afterwards and told me how much they enjoyed it, a rare occurrence. Then came the band’s first album Revelator and, among other accolades, a Grammy award — which is not always an indication of the best recording in a given category. But in this case TTB’s 2012 Grammy for Best Blues Album indicates something that expands the blues category to its outer limits. And yet virtually nothing this group plays sounds outré or pretentious, unlike some of today’s big rock-pop acts, whose ambition can sometimes waterlog their artistry. Okay let’s start with the core of the talent. How many would argue that this group doesn’t have the best combination of lead singer and lead instrumentalist of any group on the circuit today? SUSAN TEDESCHI — The ravaged emotive textures that crawl out of her throat prompt the apt comparisons to Janis Joplin and Bonnie Raitt. But another predecessor dwells deeply in her style — Tracy Nelson, a still underappreciated contemporary of Raitt and Joplin. This is most evident in the bright, clarion alto that seems the real vortex of Tedeschi’s voice. At the Berklee School of Music she sang in a gospel choir. Yet the auburn-tressed Tedeschi hardly comes across as a church mouse. Onstage she’s open-hearted, tough, sensual and earthy — thus heightening the proverbial Saturday night/Sunday morning dichotomy of the classic gospel experience. Yet as a mother of two, she shows no traces of, say, Joplin’s self-destructively desperate sexuality. And as an accomplished singer-songwriter-guitarist and bandleader of men in her own right, Tedeschi’s her own definition of a 21st-century liberated woman. If only Joplin could’ve lived to learn from her musical progeny’s apparently self-possessed wisdom. Being a Yankee from Boston (like fellow singer Mike Mattison, a Minneapolis-born black man) Tedeschi defies the estimable Muddy Waters dictum that “white kids…cannot vocal like the black man.” We know it ain’t a province of gender and today at least a few white Northern kids seem able to genuinely vocal the blues, perhaps because they did grow up in the culture, even if it was a conscious yet instinctive choice, as Susan’s was. He retains a strong musical relationship with guitarist Warren Haynes who replaced Allman in the legendary band from Macon, Georgia that redefined Southern rock music virtually single-handedly. He was among the youngest ever to receive a Lifetime Achievement Grammy award this year, along with ten other members of the Allman Brothers Band. Consider also that Trucks, Gary Clark Jr. and Trombone Shorty represented a new generation of blues musicians when the guitarist and Tedeschi (who’s nine years his elder) played for President Obama and First Lady Michelle Obama and guests on for the PBS TV “In Performance at the White House” series on February 21. Showcasing the importance of the blues in American culture, the event also featured B.B. King, Buddy Guy, Shemekia Copeland, Keb Mo, Mick Jagger, Keith Richards and other major blues musicians. As an implicit seal of approval, King, surely the greatest living blues musician, has been performing on some dates of the Tedeschi Trucks current tour. SONGWRITING – Perhaps the most surprising aspect of Revelator was that all 13 titles were originals written by this band. This was as crucial to the new partnership as their performing prowess. On Trucks’ previous band’s albums “Songlines,” and “Already Free,” (which earned him his first Grammy for Best Contemporary Blues Album) Trucks says he “was interested in making more song-driven records, and Revelator is another step in that direction. This is the first of two postings. 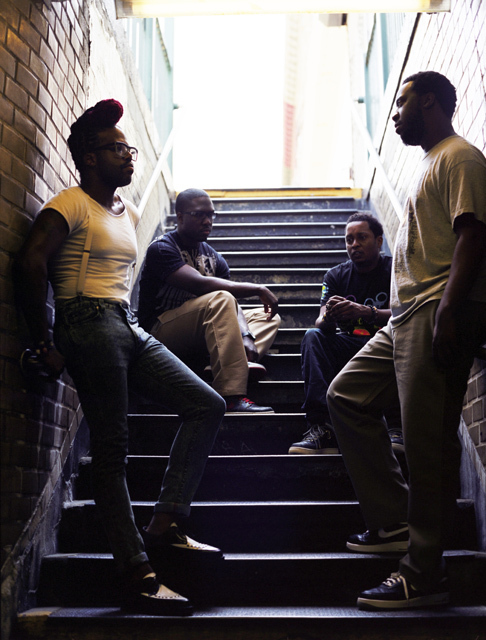 The Robert Glasper Experiment’s “Black Radio,” a live amalgam of R&B, hip-hop and jazz taking place at 7:30 p.m. on September 26, may feel like a risky experiment for the South Milwaukee Performing Arts Center. After all, this is urban music insinuating itself north to south, with much of what that signifies in terms of American and Milwaukee history. Despite clear progress, how much less racially and culturally polarized is America today? Yes, today we have boho-Bay View, but this traveling show is going into Milwaukee’s deep south. And yet, South Milwaukee is its own distinct community, SMPAC director Chad Piechocki points out. The center staged blues legend John Hammond last season. And the city got a feel for contemporary, historically-informed black music at the end of last season with Ruthie Foster, the gospel-soul-roots folk singer. She was well-received, but her earthy radiance is fairly feel-good. Yet, in his way, so is keyboardist-composer Glasper. Sure, he’s pushing the cultural edge further. Black Radio reflects a new era for the arts center and its intrepid and imaginative young director, with the concert based on Glasper’s same-titled album. The center is an impressively renovated space in South Milwaukee High School, (901 15th Ave. South Milwaukee), and operated as part of the city’s recreational department. Piechocki aims for “eclectic yet accessible” programing. The updating of South Milwaukee culture began with his resourceful predecessor, Brenda Johnston, Piechocki says, so maybe it’s more a matter of rethinking preconceptions and stereot ypes. What can you presuppose about an album like Black Radio, which seamlessly ranges from Erykha is Badu singing Mongo Santamaria’s Afro-Latin Jazz classic “Afro-Blue” to Lalah Hathaway recasting the cool ecstasy of Sade’s “Cherish the Day”? Add to that “The Consequences of Jealousy” by contemporary crossover jazz bassist Michelle Ndegeocello (who plays on the album), David Bowie’s “Letter to Herione” and Kurt Cobain’s “Smells Like Teen Spirit.” Glasper’s originals, aided by Mos Def, Musiq Soulchild and others, help it all meld. Unlike hard-core hip-hop, brings with melodic and harmonic sophistication more like the hybrids of fellow jazzer Jason Moran. 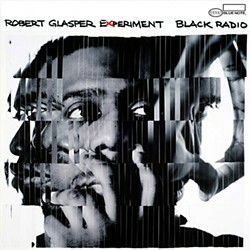 The album’s deftly wrought diversity recently earned Glasper five awards from Down Beat magazine’s 60th annual critics’ poll. Glasper is trying to challenge presumptions about and of hip-hop, and succeeding, because he’s getting played on urban radio – and during prime daytime slots. On Oct. 9, Blue Note records will release a remixed version of the album, with an unreleased track. And Glasper has been added to the lineup of the iTunes Festival 2002 (which will be downloadable live) in London, on September 23. Or Sade’s lyric: “Cherish the day, I will go astray, I won’t be afraid, you won’t catch me runnin’.” Black Radio flows and eddies to hard-won, high grade-cultural enlightenment, updating Stevie Wonder’s more politically visionary stratospheres. “For a 17-year-old kid to hear that music, who listens to hip-hop… it’s like, ‘“Hey, what’s that?”’ Glasper commented in Down Beat. His role models are Herbie Hancock and Miles Davis – “jazz musicians who didn’t just play jazz.” Glasper’s first two acoustic Blue Note recordings showed he’s got post-Monk, post-Coltrane modern jazz down cold. Piechocki himself defies stereotypes: He graduated from West Point where he majored in philosophy, then he began his venture into the arts. He writes poetry and for the theater, and is working on a project which he hopes will successfully set his verse to dance performance. Aided by a strong and supportive board of directors, Piechocki aims to stay at a high, yet indefinable, bar level. Last season had a sold-out flamenco show and this season boasts the return of the Vienna Boys Choir (Nov. 23). 2013 shows include unclassifiable physical comedian Avner Eisenberg (Jan. 25) on the center’s student series, Davell Crawford interpreting Ray Charles’ pioneering 1962 crossover album Modern Sounds in Country and Western Music (March 14), Frank Ferrante’s Groucho Marx show (April 26) and cutting-edge illusionist Jason Bishop (May 17), among others. For information, visit www.southmilwaukeepac.org, or call 414-766-5049. This article was originally published in the September 13 issue of Shepherd Express. We like to think — we desperately want to believe — we will never see violent terrorism comparable to the destruction of the World Trade Center. It’s the desperation of The Falling Man in each of us. This is deeply ingrained in the message of hope that President Obama invoked bravely in his convention acceptance speech. Understandably he avoided a direct reference to the tragic day because ridding the world of its mastermind bin Laden is a signature accomplishment of his first term. But how do we live with the horrible spurts of violence, much of it by domestic terrorists, like that in my own community recently, where a deranged neo-Nazi murdered Sunday service worshipers in Oak Creek? That the killer misidentified — willfully or not — the Sikh worshipers as Islamic shows how sociopathic and Islamophobic American response to the post-9/11 era can still be. The authors of the Times piece analyze whether America has a sufficient strategy for terrorist “resilience.” This involves ways of addressing matters of internal security in domestic business practices, but must inevitably extend to a collective psychological strength, well-being and, yes, sanity. The Army now has a Comprehensive Soldier Fitness program to teach soldiers how to be “psychologically strong in the face of adversity, such as combat,” the article said. The training classes are available to family members of troops as well. 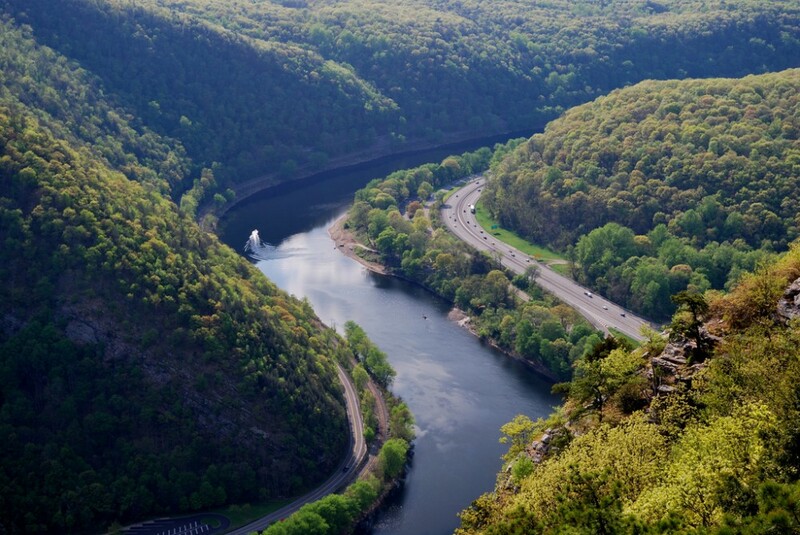 The University of Pennsylvania helped design the program, which also focuses on “post-traumatic growth” as well as personal and family emotional fitness. I’ve never been big on the post-9/11 Homeland Security Department, but perhaps it’s beginning to get some things right in his priorities. 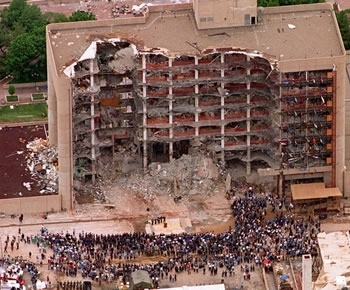 The article concludes with a telling anecdote about Oklahoma City’s response to Timothy McVeigh’s 1995 bombing of the Alfred P. Murrah Federal Building, which killed 168 people, including 19 children. What’s inspiring to me is the cultural enlightenment that grew out of this tragedy. Shanker and Schmitt report that Oklahoma City’s civic healing renovations included a performing arts center, library, a baseball park, public schools, a convention center and a river walk — now home of the United States Olympic rowing team. Having a young playoff-caliber NBA team doesn’t hurt the city either. The city revitalized and recovered by accepting local and national governmental roles for vital social and cultural infrastructure — in a way that survival-of-the-fittest Ayn-Randian vice-presidential candidate Paul Ryan could not fathom. Norick seemed to invoke The Falling Man and terrorism of all kinds in his sweepingly bullish statement. I will be fascinated to see how Oklahoma City votes in the upcoming presidential election. Pundits generally agree that the Democrats made more hay with their convention than did the Republicans. I agree — Bill Clinton especially picked off GOP allegations against President Obama like so many ducks in a barrel, and Clinton and Michelle Obama, Joe Biden, Elizabeth Warren and a number of other speakers often worked the classic American gospel call-and-response dynamic as if this was a massive Sunday Baptist service. Actually the best such line came from former presidential candidate John Kerry: “Ask Osama bin Laden if he’s better off today than he was four years ago!” Kerry, of course, is also the Vietnam veteran whose heroic war record was distorted by Republican stooges in the 2004 campaign’s Swift Boat farce, framing him for supposed cowardice. But for the electorate to understand this opponent, Democrats needed to fire up their base and engage their often fractional culture. Tapping into the call-and-response dynamic was very smart because it may also be a way to allow the coveted undecided voter in — by eliciting a response. At seems to me, undecided voters need to sense that someone speaks to them and values their opinion. Some of those undecided voters are surely nonreligious. That’s part of the risk of using the call and response, in the context of a nationally televised convention, because it is so associated with religious ritual. I recently had a conversation with an atheist neighbor who has an aversion to any cultural reference with religious association. I mentioned Jesus Christ and the Golden rule as a good fundamental way to live one’s life without any excess trappings of religious dogma. He said “as soon as you say Jesus Christ” you are implicitly approving the religious impulse that feeds into all the extremism we suffer from, the kind that led to 9/11. That’s the stance of New Atheist writer Sam Harris, this man’s new guru. This seems a needlessly negative stance that disavows all the good that religion has produced through the millennia. Of course, the stance is also very understandable, given the evil, horror, tragedy and trauma that fateful day produced. The excellent 2006 documentary on 9/11, The Falling Man happened to run on a cable station concurrent to the final night of the Democratic convention, a reminder of the event’s upcoming anniversary. So I switched between the documentary and PBS’s convention coverage. 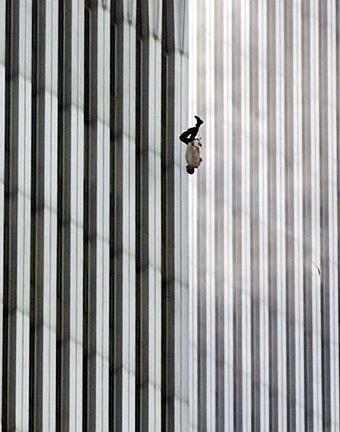 The Falling Man brought home, in harrowing and poetically chilling human terms, the crux of that tragedy. It focuses on the investigation, especially by Esquire writer Tom Junot, into the identity of the man who jumped from an inflamed room in the World Trade Center — in a photograph which has become perhaps the tragedy’s most iconic image. The photo was taken at 9:41 AM on September 11 by Associated Press photographer Richard Drew. The image also inspired, among other fictional attempts to address this subject, the novels Extremely Loud & Incredibly Close by Jonathan Safron Foer (also a recent film) and Falling Man by Don DeLillo. I see a connection here to The Falling Man as well. He was, by most accounts, a well-liked and hard-working 43-year-old African-American audio technician named Jonathan Briley. Certainly there’s profound irony in that a man whose race is historically the most reviled in America, rises to a job in the tallest building in America and then plunges to his death on the day of America’s greatest contemporary tragedy. Briley’s sister Gwendolyn saw the picture the day it was published. She knew that Jonathan had asthma, and in the smoke and the heat would have done anything just to breathe. . . . So Briley became a new archetypal tragic American hero. His father is coincidentally a preacher who told Junot that he could not address the issue of his son’s death in the photograph because his job is to tell people to go on, in the face of tragedy. That was something he was unable to do at that point. His sacrificed son can signify the black man who has come so far and his death an acknowledgment of the inhumanity that kept him down for so long. More broadly, many people who have suffered and died through the last Republican administration signify those who most need just “a fair shot,” as President Obama put it. The Democrats clearly were willing risk of the call-and-response modality because the inherently inclusive dynamic of the gospel ritual is fundamentally American, and even reclaims some of the religious potency that Republicans and the far right supposedly command. The falling man who haunts us might even signify the 99% who have all fallen from where they were during the several decades of stagnating wages that led to the proliferation of “the working poor” and subprime mortgage loans and corrupt business and Wall Street practices that led to the recession. How tiny that abject figure must’ve felt, as he plummeted from the tallest building in the world. It also seems that in the ensuing decade that “tiny good thing” has grown into a large and potentially powerful good thing. At the end of Foer’s novel, the book includes a sequence of photographs of another of the twin tower’s falling men. Yet as your thumb slips forward through these pages they become an old-fashioned flip-action device. But Foer arranged it so, in this action, the falling man ascends. This may seem like facile symbolism, but it’s also a device that would likely appeal to Oskar Schell, the novel’s pacifist nine-year-old protagonist. And it’s another way of looking at an indelible moment. Art, and even political stagecraft, may carry tragic life to new possibility. Otherwise we’re still left with a hole in our heart, as big as Ground Zero. Call and response becomes a collective healing process. Just maybe we can hope for more than what Mamie O’Brien suggests. 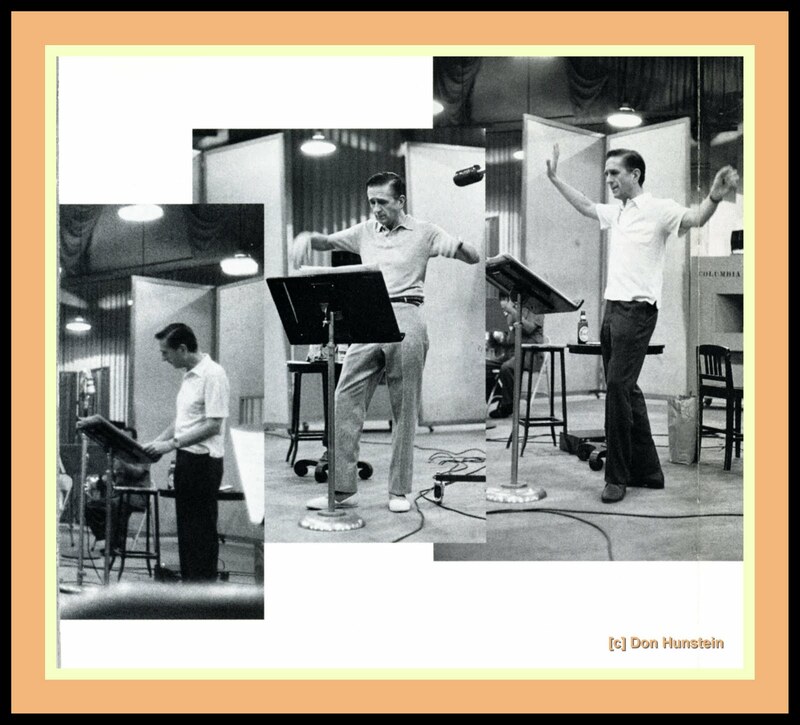 Gil Evans conducting, and letting in happen, in the early ’60s. In America there is individualism that begins selfishly, of necessity, but then stays selfish, feeding hubris and often greed. Then there is individualism that nurtures its own creativity and, when the time is right, shares it — feeds it into simpatico compatriots, who help make it great American culture, begetting wealth to be shared by generations. 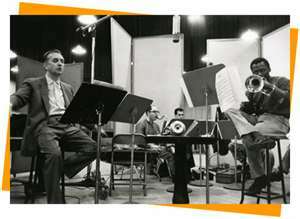 The late Gil Evans was the godfather-Svengali of modern jazz arranging, the bridge between Debussy and Ellington to Vince Mendoza, Darcy James Argue and Maria Schneider, who helped realize this project. Evans’ brooding tapestries engulfed the stunning silhouettes of Miles Davis’ exquisite solos on Sketches of Spain and Porgy and Bess. Evans’ exploratory affinities stretched to Hendrixian textures. Now, Ryan Truesdell (who studied with another great modern arranger, Bob Brookmeyer) has dug up early ‘60s scores from the Evans family archives. 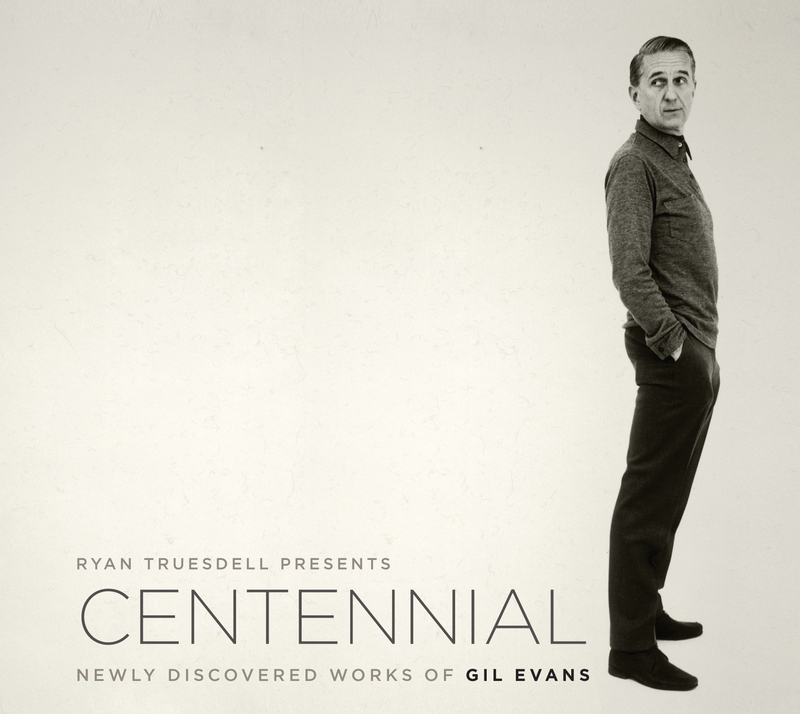 Centennial: Newly Discovered Works of Gil Evans almost brings Gil back to life in unheard material and re-casting of Evans classics, from the tabla-tinged “Punjab” to the world-weary “Smoking My Sad Cigarette” and Weill/Brecht’s “The Barbara Song,” whose sonic mysteries rise more full-throated than the original. Luxuriate in this. As he studied these scores, Truesdell discovered “fascinating musical references and techniques that illuminated dimensions of Gil’s personality and gave me more insight into him as a person,” the arranger and conductor writes in the liner notes. So this music — with superb vocals by Kate McGarry and Luciana Souza and solos from pianist Frank Kimbrough, vibraphonist Joe Locke, and tenor saxophonist Donny McCaslin, among others — feels mighty damned true to Evans. And yet, as thrilling as Centennial is to hear in all of its high-tech digital detail, there is something missing. That must be Evans himself — in the studio or on the bandstand. There’s an uncanniness to his own recordings that isn’t contained in the scores, I suspect. It was the jazz element — that of the leader with his players, hearing the voices in his head then subtly re-shaping and re-blending the colors to the strengths and even the moods of his musicians. The best Evans sounds like alchemy. And here’s where the Duke Ellington connection comes in. Ellington knew precisely what to get out of the unique talents of each of his players. And they became greater players for that contextual opportunity. For example, the great saxophonist-composer Wayne Shorter probably learned a lot about dynamics and nuance in a large setting as a soloist in the original “The Barbara Song” on The Individualism of Gil Evans. Here’s where Evans’ phantom Svengali -like sensitivity to the musical moment comes in, as Bob Mintzer notes above. And Like Ellington and Basie, he also played some of the greatest less-is-more orchestra leader jazz piano, his dense voicings and breathless grace notes infusing the players with evanescent Evans magic. Slightly less lovable perhaps is the more psychologically reflective Sketches of Spain. By turns stoic and heartbreaking in its eloquence, it touches on tragedy, so penetrating is its beauty. Evans is the sort of quietly humble, pay-it-forward genius that individualist America needs today, as it always has. This article grew out of a review of a CD, Gil Evans Project, Centennial, originally published in the August 30 issue of tThe Shepherd Express in Milwaukee. *Down Beat magazine, from “My Favorite Big-Band Album: 25 Essential Recordings” by Frank John Handley, April 2010. Mintzer’s quote is also from the same article. The Schneider quote is from Down Beat, “Gimme Five,” October 2000. 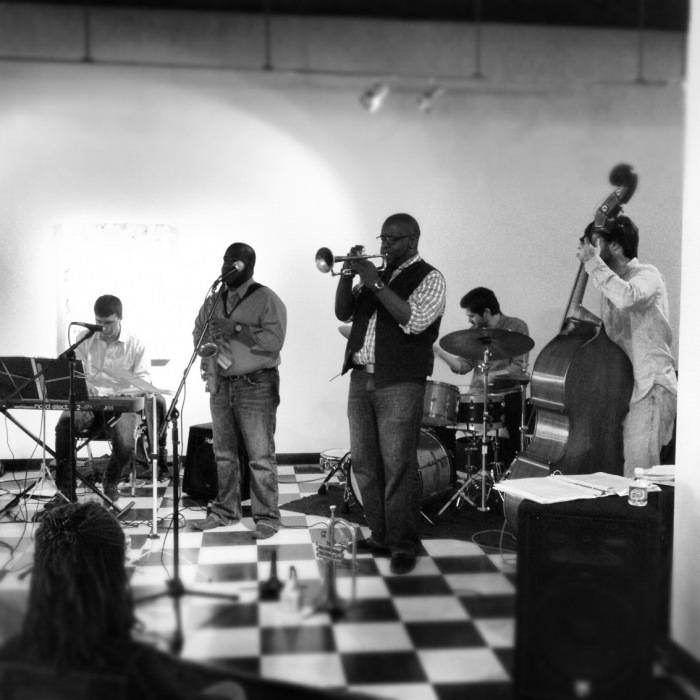 The Marquis Hill Blacktet playing recently at The Jazz Gallery Center for the Arts in Milwaukee’s Riverwest neighborhood. The original Milwaukee Jazz Gallery transmitted a far-reaching beacon, a creative-freedom vibe even the Statue of Liberty might’ve caught, and tapped her toe to. America’s art of improvised musical expression thrived in arguably the greatest jazz club in Milwaukee history, with a reputation that radiated throughout the nation’s jazz-musician community. 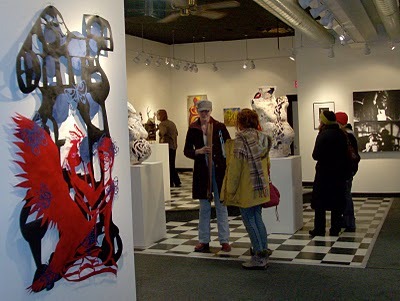 Today the same address, 932 E. Center St., houses The Jazz Gallery Center for the Arts, a venue for performances and jam sessions and art exhibits. This honors and reinvents the tradition of the original. After the club’s glorious but difficult run, from September 1978 to the fall of 1984, founder and owner Chuck LaPaglia moved on — to propose and then book live jazz at Yoshi’s in Oakland, today one of the premier jazz clubs in the world. “But many musicians still talk about how special the Milwaukee Jazz Gallery was,” LaPaglia recalls. Here’s a review of the piano titan McCoy Tyner, at the height of his powers at the Jazz Gallery on June 12, 1981: “As he unleashes a solo, his left hand rears high above the keyboard delivering lightning bolts of bass. His right wrist appears to be pouring fingers all over the keyboard. 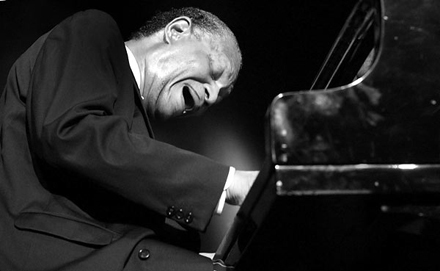 McCoy Tyner in 1996, still playing with the power and fire he displayed at the Jazz Gallery in 1981. “A whole generation of Americans has no idea what serious jazz is,” laments Mark Lawson, president of the Riverwest Artists Association, which owns the facility. The original Jazz Gallery also staged Dizzy Gillespie, Betty Carter, Freddie Hubbard, Stan Getz, Dexter Gordon, Dave Holland, Wynton and Branford Marsalis, Art Blakey and the Jazz Messengers and many more, a living jazz history. You could catch world-class blues acts like Koko Taylor and Albert Collins, and local theater groups like Theater X — as it built a national reputation. The Jazz Gallery also nurtured local musicians who now have national stature, including Brian Lynch, David Hazeltine and Lynn Arriale, and even notable non-jazzers like the Violent Femmes and Paul Cebar. Among other top-flight local musicians the venue staged were Melvin Rhyne, Manty Ellis, Berkeley Fudge, and What On Earth? and its lyrical brand of avant-garde. Renowned pianist-vibist Buddy Montgomery, then residing in Milwaukee, used the space for meetings of The Milwaukee Jazz Alliance, helping to define LaPaglia’s vision for it as a community resource. The Brian Lynch Quartet (l-r, Lynch, Sam Belton, Manty Ellis and Jeff Hamman) at the Jazz Gallery Center for the Arts. That legacy drives Lawson. “We are passionate about the mission to combat the commercialism that has swallowed up America’s original art form,” he says, noting the music’s paltry presence on local radio and in press coverage. African World Festival’s jazz is mostly the smooth variety. Even the huge umbrella of Summerfest has long since forsaken jazz, although several local groups made inroads on the Potawatomi stage this summer. Another Jazz Gallery CFA partner is the Milwaukee Youth Symphony Orchestra.“This collaboration is in its infancy in finding ways to work with kids across disciplines,” says Jeno Somlai, jazz studies director at MYSO. “I do see a renaissance beginning, and hopefully a groundswell of activity will bring recognition to Milwaukee culture.”The opportunity to pursue one’s creativity “changes a person’s life, whether it’s jazz, poetry, art or dance,” Lawson says. Such intimate, informal venues remain the lifeblood of the improviser’s art. The gallery hopes for more partners. MJV and MYSO have given the grassroots facility citywide outreach and worldwide presence. 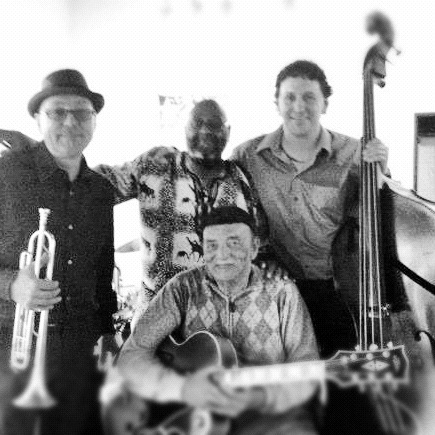 For information on Jazz Gallery events and hours, visit www.jazzgallerymke.com . The MJV site is www.milwaukeejazzvision.org. *LaPaglia’s collection of the Tyner review and numerous articles about the club are documented in Milwaukee Jazz Gallery, an 8 x 11″ ring-bound anthology ($20), available at the Jazz Gallery Center for the Arts. This post was first published in an edited version in the Aug. 30th issue of The Shepherd Express.